International KeyReturn was founded in 2009 by the directors of two separate Perth marketing agencies. They saw there was an opportunity to provide the KeyReturn product and service to the corporate market. Others had tried to launch a similar product, but nobody really made it work or engaged with Australia Post. Chris and Carl each have over 30 years’ experience in marketing and currently work with some of Australia’s leading companies. They understand the importance of getting the best ‘bang for your buck’ for a company’s marketing dollar spend. They know that most promotional products don’t last much more than a few weeks or months, meaning a bad ROI for the business. They created a product in International KeyReturn that ensures your brand stays ’in the hand’ of your valued client for years. That’s because there is a real reason for your client to use their keyring and keep your brand in their hand. International KeyReturn’s first client was AutoMasters in WA, who used to get returned keys back every week – the problem was no-one knew who owned the lost keys, because there was no way to identify the owner. Since they have introduced their AutoMasters branded International KeyReturn keyring with the unique ID and return feature, AutoMasters have now returned over 300 sets of keys to their very relieved customers. 83% of AutoMasters clients still have their keyring on their keys after 4 years and that is a great ROI! They now have over 100,000 keyrings in their customer’s hands. Australia Post contributes to our success through the efficient return of lost keys. We care about all of our clients and some we are also able to assist back to show we care about the work they do in the community. 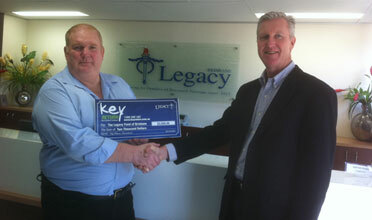 Gavin White – Legacy Brisbane & Ross Cooper – International KeyReturn handing over a cheque for $2000 to support the work of Legacy. Our International KeyReturn product and your brand stays in the hand of a client for years. If it’s not a KeyReturn keyring – it’s only a key ring on a set of keys that stays lost ! !